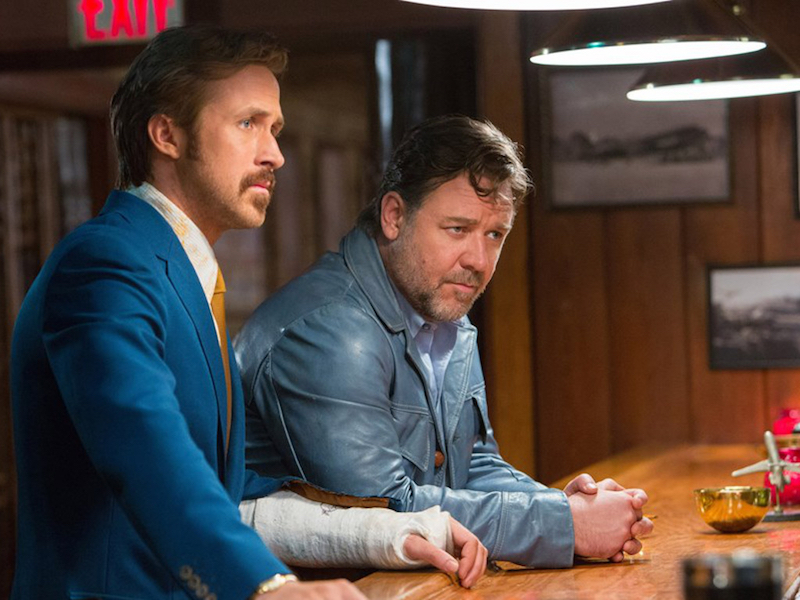 After a brief detour in the superhero realm with Iron Man 3, writer/director Shane Black returns to his buddy cop movie roots with The Nice Guys, a hilarious new detective comedy set in the decadent playground of 1970s Los Angeles. Ryan Gosling stars as Holland March, a bumbling private investigator who crosses paths with thug-for-hire Jackson Healy (Russell Crowe) while looking into the disappearance of a young girl. Despite an initial confrontation between March and Healy that leaves the former with a broken arm, the two eventually pair together to find the missing suspect while also uncovering a larger criminal conspiracy in the process. The plotting grows increasingly dubious as the story progress but clearly the film’s biggest asset is the powerful comedic chemistry between its leads, which is surprising given the past work from the two actors. Gosling has done some comedies before, most recently last year’s The Big Short, but he’s still most notable for his dramatic roles and as far as I can tell, this is the first time that Crowe has ever been involved with a comedy or at least had a comedic role. Both come across as complete naturals and form the kind of believable bond that’s so important for a movie like this to succeed. Gosling gets the juicer role in terms of comedic opportunities and he does a near genius level style of physical comedy in scene after scene. Sure, he gets plenty of quippy one-liners and back-and-forth banter with Crowe but he shines most when he’s tasked with some truly outlandish choreography. The most clear example of this is a bathroom sequence in which March, in an attempt to ambush Healy, fumbles for his gun while simultaneously trying to hold open the stall door and extinguish a lit cigarette that’s fallen into his pants while he’s also sitting on the toilet. Quite a bit to manage. Meanwhile, Crowe mainly plays the straight man to Gosling’s lovable goofball but he doesn’t take things so seriously that he seems out of place or uncomfortable, even during some of the more ludicrous turns in the story. An early voiceover establishes Healy as a man who hasn’t quite found his place in life yet and as someone who is trying to find the good within himself but Crowe doesn’t burden the character too much with issues of the past. Healy has just the right amount of groundedness to make March’s pratfalls seem even more ridiculous by comparison. I shouldn’t neglect what could be the film’s secret weapon: a 13-year-old Australian actress named Angourie Rice, who plays March’s daughter Holly and serves as the closest thing to the movie’s moral conscience. She gives a confident and smart breakout performance and her character’s lack of cynicism amid troubling circumstances gives the story a more humanizing angle than it probably deserves. It’s about one or two re-writes away from being a much tighter and most likely a funnier film overall but as it is, The Nice Guys is fast, loose and plenty of good fun.